A reticulation system is running on top of this aviary for showers in the summer months. There are also some that say wild parrots dealing with extreme temperatures is different to our captive parrots. If that is the case, it is only because we don't allow our captive parrots to adapt to hot or cold weather in the first place. 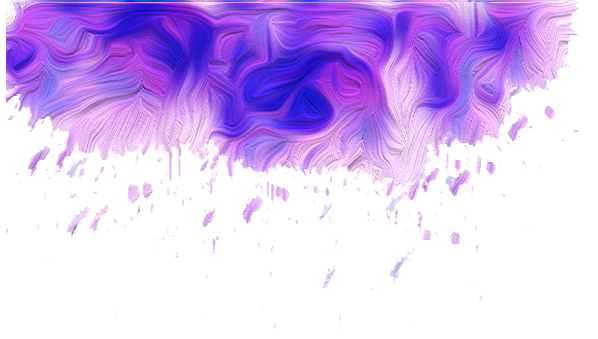 The more a human is outside doing work, gardening or anything else the more they adapt to the heat or cold and don't feel it as much. The same rule applies to parrots so give them the opportunity to adapt to what ever temperature your area will give them. 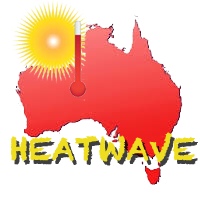 In Australia we have extremes in hot and cold weather. 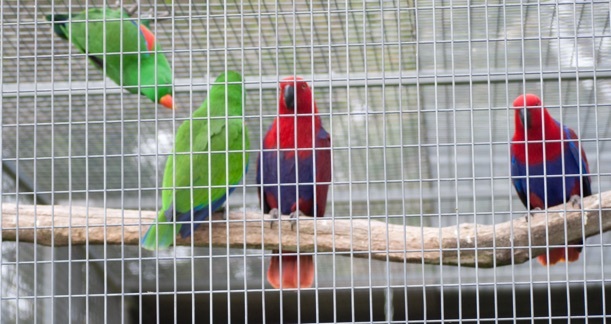 Most of our country can be hostile but it is very common for us to have outdoor aviaries and a great success rate in keeping parrots outside. Then there are other cooler or milder climate countries who argue that they should not be outside in these weather conditions and often set up a specific temperature range that they allow their birds to be, whether it consist of having the air conditioner on or a heating. Having them out in hot or cold weather, it's really just up to you to use your common sense and to learn what you can do to help the feel more comfortable in different temperatures. But if your bird is adapted or adapting and you take some simple steps (use your imagination) to keep the bird comfortable then there is no reason why they cannot be outside. 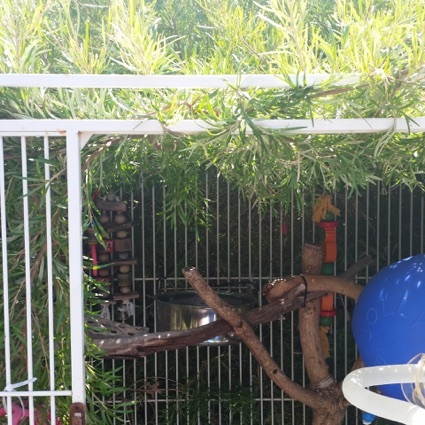 In summer when it's very hot and your bird is outdoors you should make sure he has access to plenty of fresh clean water and has at least part shade throughout the whole day. Freeze the bird food before putting it out. 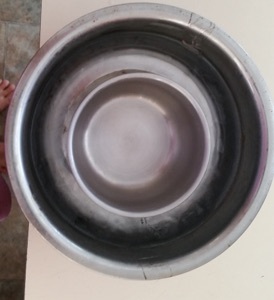 Fill a larger water dish and freezing it, then adding the slightly smaller water dish inside and top with water. This will keep the water chilled for much longer. You can also do this to keep food cold. Pictures below. Place a wet towel or sheet over half of the cage. This will provide some relief. You can also place the wet towel or sheet in a freezer to chill before covering part of the cage. 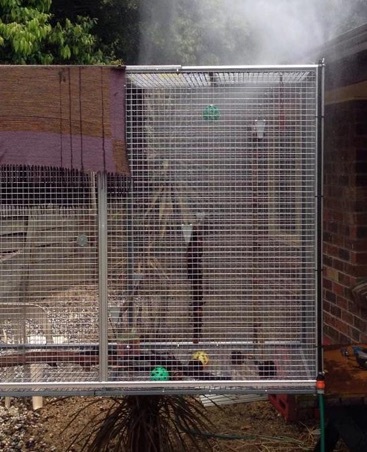 Attach a spray, sprinkler or retic system to the top of the cage or aviary and set a timer on to go off and cool down the cage as well as offering the birds a refreshing shower. Only have the cage in a place where it is shady through the hottest part of the day and the sun beams through only later the afternoon. 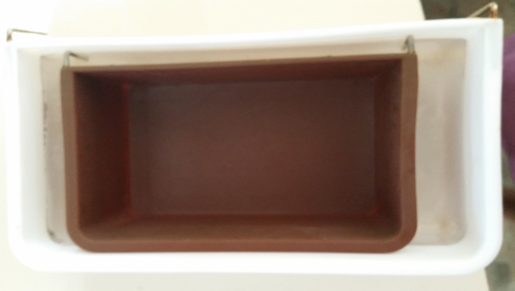 Place a clean new kitty litter tray in the cage or a bird bath for the parrot to dip in. Provide plenty of greenery in the cage, branches filled with leaves, flowers etc and squares of grass for the bottom of the cage. This will help provide relief from the heat. A lot of people do worry about extreme temperatures affecting their parrots. People are often afraid to take their parrots outside if it's too hot or too cold. In the dead of winter and summer you can and should still take your bird outside for fresh air and sunlight. 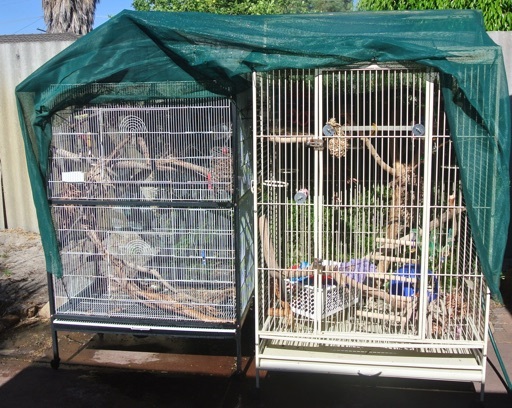 In Australia it is very common to have aviary or outside birds and we easily do it the extremes of heat with some common sense. All you need is some simple things to make it easier for your bird. A parrots normal body temperature is much higher than ours. It is between 39 and 40 degrees Celsius. Placing a thick blanket over the aviary or cage to soak will help to keep the water. The thin blankets don’t retain water so do dry out quickly. As an alternative you can use a thin blanket and set up a retic system to keep the blanket wet and cool down the aviary or cage. I have a cockatiel who has developed a strange behaviour. For the first ten years of his life hated being outside. Cricket was very much an indoor bird and would scream bloody murder whenever he had to spend time outside. No matter what I tried he just refused. When we moved he completely changed. He loved being outside every day but only for a few hours, so he would spend every morning outside and afternoon inside, until summer arrived. The hotter it got, the more time he wanted to spend outside. At 38 degrees Celsius I hauled him back inside with him kicking and screaming. He didn’t want to go inside so I would keep a close eye on him. He was very content to potter around his cage in this heat. What I observed with him was if it stayed below 30 degrees he would only want to stay outside for a few hour before asking to come inside. Between 33 and 39 degrees he would want to spend the whole day outside. Once the temps reached above 40 degrees, that seemed to be his limit and he would ask to come inside again. I spent hours and days watching his behaviour, he was happy. The heat didn’t seem to distress him. Still a bit worried about it, at midday every hot day I let him have a cool shower under the hose and have now come to the conclusion that he knows what temperatures he can tolerate. My Eclectus on the other hand is very much an indoor bird, enjoys mild to warm summers but doesn’t cope in these hot days, so he’s a morning outdoor bird and afternoon indoor bird when it’s too hot. Observe your birds over a period of time. If they are showing clear indications through body language that they are happy and content in the weather and have plenty of cool water, shade and anything else they need then let them be outside.